Connor Boyack is a web developer, political economist, social media consultant and author of the upcoming book Latter-day Responsibility, a prequel/sequel to the popular Latter-day Liberty . Connor views MMM's readers (or was it founders, can't remember) as largely irresponsible so would like to giveaway one of his books to help remedy the situation (okay, it was founders). 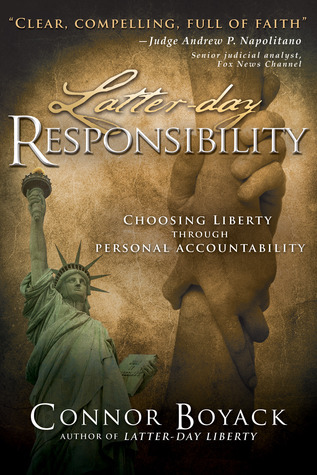 For this giveaway, Connor is generously providing one reader with a signed copy of his book, Latter-day Responsibility. Connor also humored us by answering some questions (some serious, some less so) below the giveaway guidelines. • 7 days to enter (closes Sunday, November 11th at midnight). • Winner announced Tuesday, November 13th. Q: Tell us briefly about your new book, Latter-day Responsibility. In many ways, this new book is a prequel to Latter-day Liberty, released last December. In that book I primarily discussed liberty in the context of what the government should not do. In Latter-day Responsibility, I discuss liberty in the context of what we should do. Liberty cannot exist without a foundation of personal responsibility; to the extent that we do not take care of ourselves and those around us, then people will cry out for the state to take care of us for ourselves. So this is a step back after the first book to understand something more fundamental, and recognize that if we want to promote liberty, limited government, etc., then as trite as it sounds, it begins with us. My book dedicates a chapter to each of several personal responsibilities that I believe we must individually and collectively fulfill if we're to have a shot at reducing the size and scope of the state. Q: Why did you feel this follow-up to Latter-day Liberty needed to be written? I didn't, at first. As I explain in this book's preface, Latter-day Liberty was meant as a standalone volume. But one day while coming home from a book signing I realized that I had only provided half the equation; this book is meant, not as a follow-up, but as a companion to the other. Understanding what liberty is and how we can realistically enjoy and defend it is a conversation that cannot be had without focusing on personal responsibility. Hence the book. Q: Do you have political aspirations on a local or national level? Good heavens no. I often have people encouraging me to run for this or that, but it's not for me. I know a lot of politicians at all levels of government, and watching how many of these people change over time is discouraging enough. It's a messy business. There's loads of compromise and soul-sucking attacks along the way. My mother has been on city council for something like a decade and it's both immensely boring and amazingly controversial with all the intrigue, power plays, and on and on. I prefer to persuade and educate. My future is with Libertas Institute, a think tank I founded last year which has ambitious goals and great opportunity here in Utah. Q: Did Orrin Porter Rockwell shoot Lilburn Boggs? Q: Glenn Beck - embarrassed by him or is he on your speed dial? I prefer to let the man speak for himself: he's a rodeo clown. He says a lot of good things, but he says some horrible things as well -- enough that I steer clear of whatever he's up to and don't recommend others follow him. Your readers may be interested to read this open letter I wrote to Beck earlier this year. It got the attention of Pat Gray, his sidekick, whose response I include in comment #26. Q: “Somebody” by Depeche Mode or “Forever Young” by Alphaville? Q: Who is the most dynamite of the Dynamites? Kip, Uncle Rico or LaFawnduh Lucas-Dynamite? Being a web developer by trade, I love technology, so: Team Kip!